Today is National Cheese Day! I think this may be my favorite of all the food holidays so far this year. 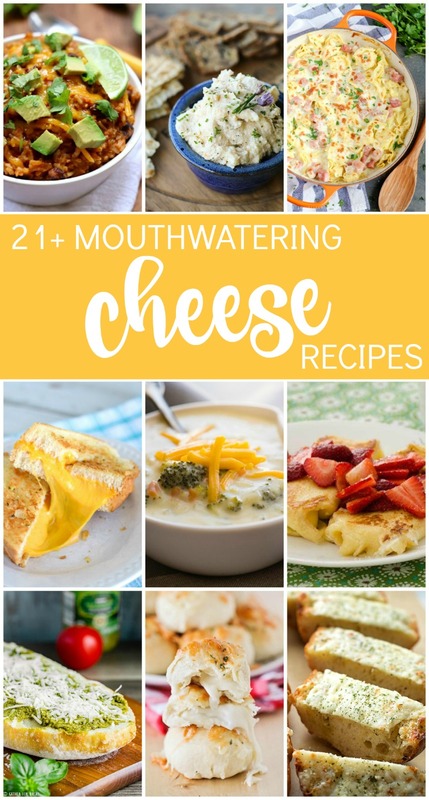 I am in love with all things cheese. 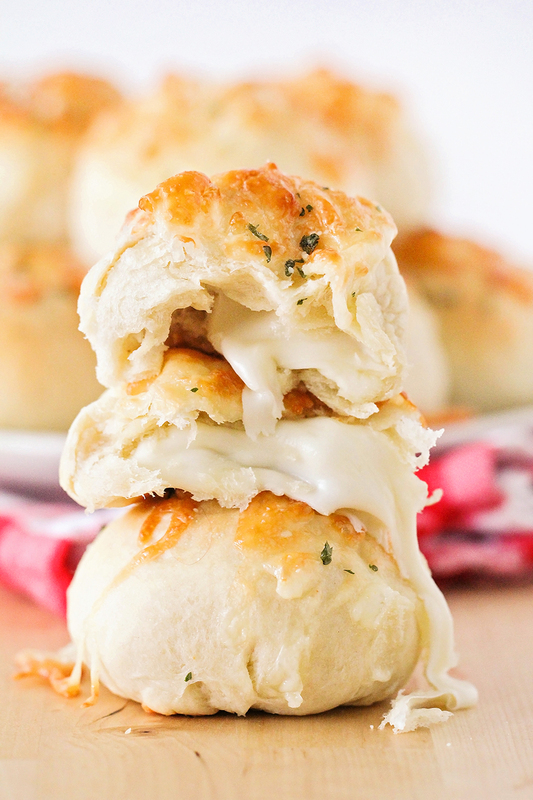 I can't really think of anything better than gooey, melty, savory cheesiness! 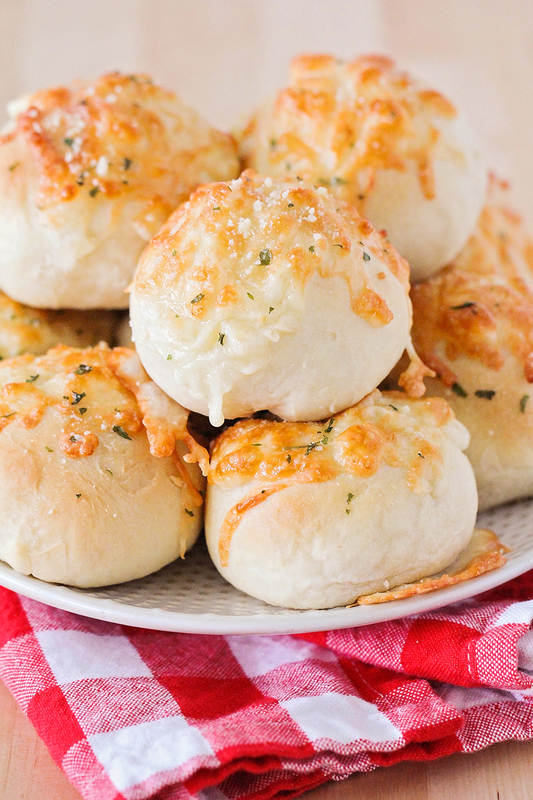 These butter and garlic stuffed cheese buns are the perfect way to celebrate cheese day. 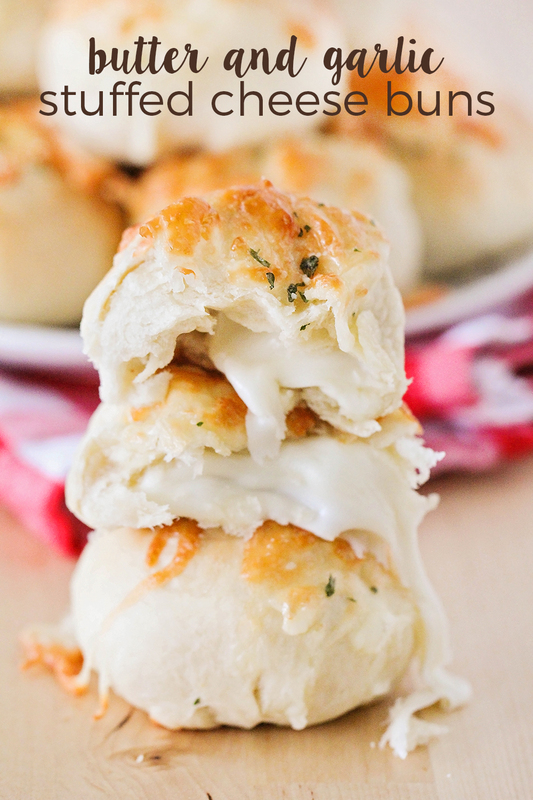 They're soft little bread pillows, stuffed with gooey and melty mozzarella cheese, topped with more mozzarella and parmesan, and baked to perfection. They're a delicious side dish for pasta or soup, or a fantastic snack for any time! 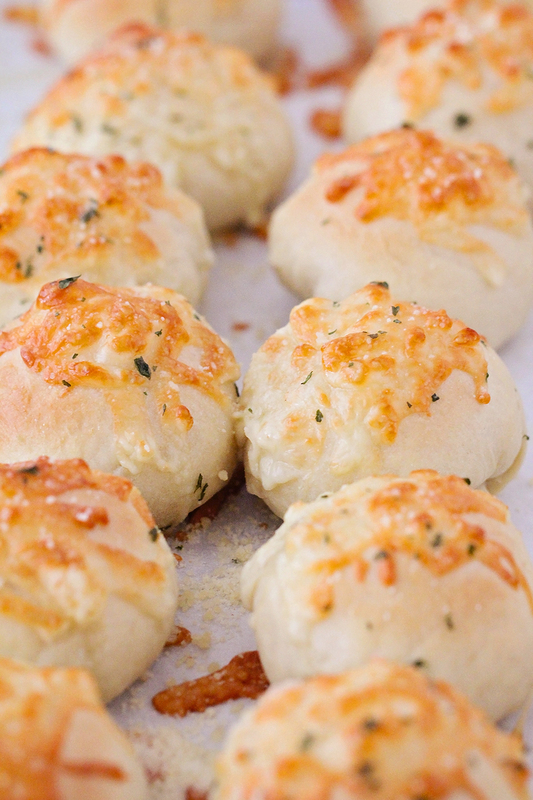 These cheese buns smell heavenly while they're baking, and the combination of cheese and garlic is delightful. They're not exactly health food, but they're so delicious that you won't be able to stop eating them! In a large bowl or the bowl of a stand mixer, dissolve the yeast and sugar in the water, until bubbly. Add the garlic powder, butter, and oil. Add two cups of the flour and the salt, and stir to combine. Add the remaining flour, 1/4 cup at a time, to form a dough that is just slightly tacky to the touch. Place in a greased bowl, cover, and let rise until doubled, about one hour. Preheat the oven to 375 during the last ten minutes of rise time. After the dough has risen, punch it down gently and divide into 18 equal sized pieces. Roll each piece into a ball and flatten with your hand. Place a cheese cube in the center, and fold the dough around the cheese. Place seam side down on a greased baking sheet. Top with shredded mozzarella and sprinkle with parmesan. Bake 12-15 minutes, or until the buns are golden brown. Whisk the garlic powder and parsley into the melted butter. Brush the butter mixture over the warm buns. Serve warm. There is salt in the ingredients but not in the recipe itself. Is this a mistake or did you just forget? It should go in with the flour. I have updated the recipe above. That is what I thought. Made the recipe today and it was amazing. Thanks for posting it 😄😄😄.